Brief interview with IanZeigler about the making of his stunning Open MAC shots using Pulldownit Macos version. How did you arrive to the idea of these shots? We were given the task of creating a generic open for the MAC conference (college football and basketball) to air on our local sports network (sportstime ohio). 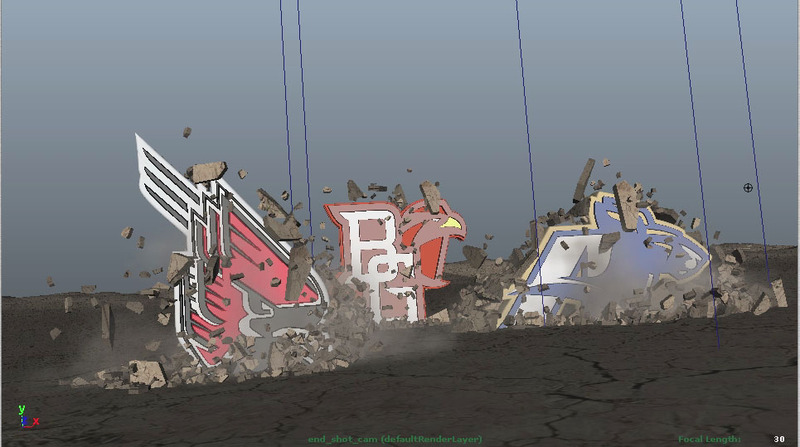 We knew we wanted to show all the college logos in some type of 3D environment. With only about 2-3 weeks to go from concept to final product with a staff of 3 people. 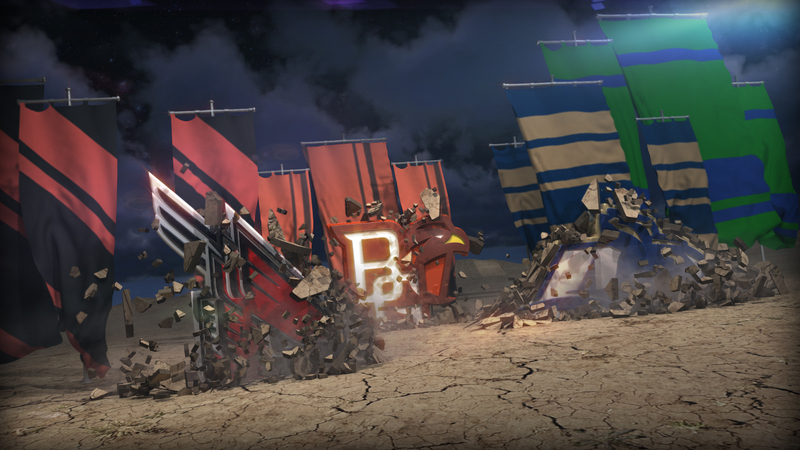 I wanted to make some banners and maybe a generic stadium with some logos crashing around. Looking at lots of different references i liked the “warhammer” look for school battling it out. From there i started quick sketches. Due to time constraints any architectural elements were taken out of the equation. Once i had a general idea i started building pieces in 3D there is no time to waste. Which tools have you used for making this shot? pen, paper, Maya 2011, PDI plug-in, After Effects & Photoshop. do you feel software usually help you to develop your ideas or mostly do >> you feel computers limits your creativity too often? Occasionally through the process of working i stumble across a “happy accident” and something cool is born, but most of the time i feel the computer is limiting and i’m wrestling to achieve the look i want. 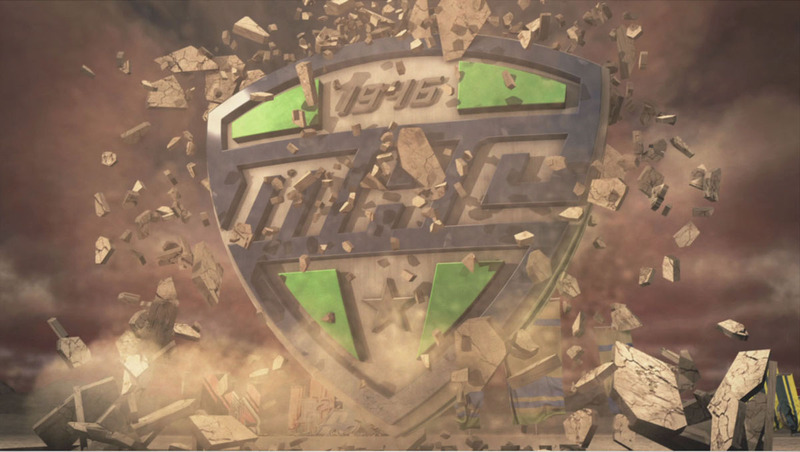 Mostly just the logos breaking through the ground planes. How did you drive the interaction between animated objects with simulated ones? I set up one passive ground plane that everything sits on and 2 subdivided cubes for destructable ground to vary the soil layer thicknesses. 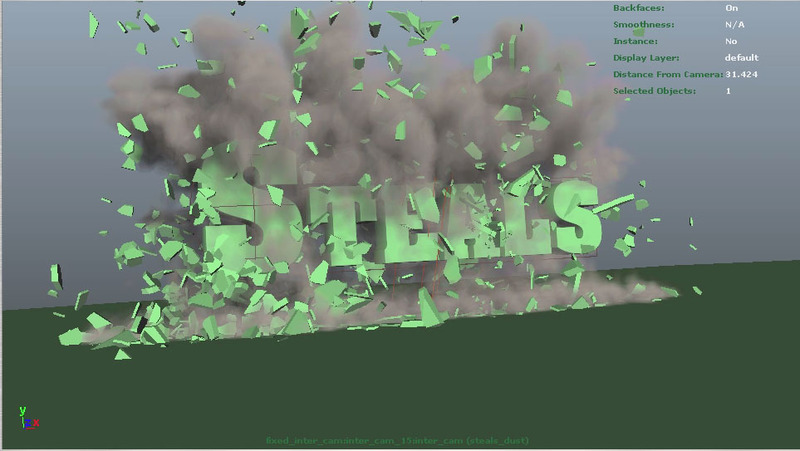 I proceeded to pre shatter the 2 ground cubes in areas i knew the logos would smash through using the “shatterit” feature of PDI once everything was pre shattered i used PDI fracture basic (which is super cool) to put everything into a group type thing ready to be destroyed. 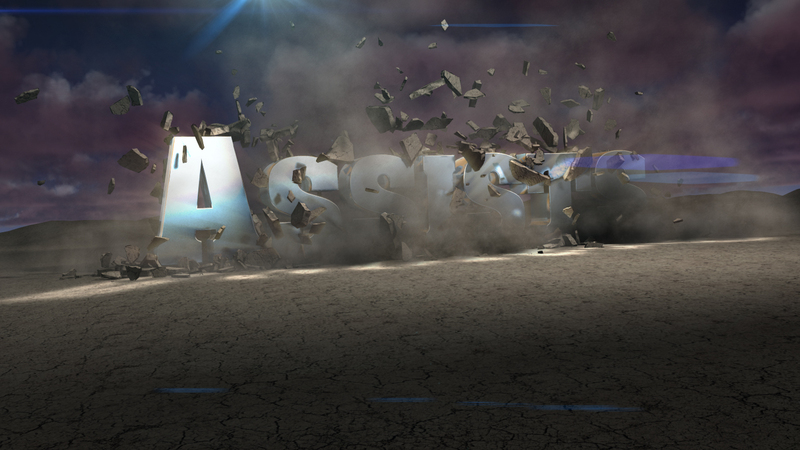 I did build stand in objects “collision shapes” that matched the modeled logos so i could animate those to break the ground planes. Then i just tweaked some solver setting and adjusted gravity and started baking simulations out at 80-120 fps depending on the shots. Once i had all my geometry baked out i had stuff to emit particle instanced debris from and used Maya fluids to create thick dust. Tell us your feelings about Pulldownit at this moment, even whishes about future development. I find it overall nice just if the shatter tool could shatter crooked lines on geometry not just straight ones would be great. Tell us a little about yourself, your background, future projects.. I interned at industrial design firms in high school looking to start a career as a product designer. I went to college at the Cleveland institute of art because they have an excellent ID program. Then of course once in school i started doing more creative stuff, drawing, animating, installations, and decided to go down the 3D generalist route because i knew i could apply 3D to lots of different areas. architecture, product visualization, creative, etc. After college i got a job at NBC and Sportstime Ohio in Cleveland doing broadcast graphics and mostly show opens and packages and news sponsors. And thats where i am now. Still learning and always trying to improve my skills.